These just in, I mean out! Still waiting for the back to cool a little more before unloading it. I love the transparency the slip has with the wax resist. This one is a tad bit more yellow than in life. 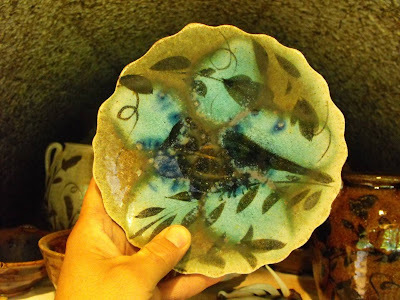 This plate actually has a bird in the center with the blue glass "sprinkles" and plate glass at the edges that have melted towards the center forming a sort of flower petal. 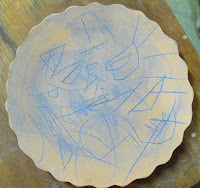 and then the copper changes back to green/turquoise later in the firing. 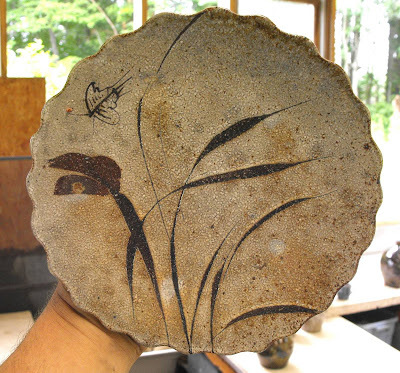 Here is a series of pictures showing how my plates are wadded and fired. This technique was developed by my buddy Will way back when. 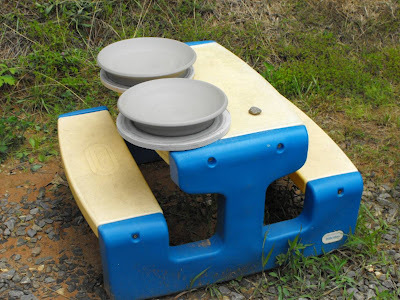 First my wadding station has a soft surface that won't chip the slip off of the pots. The wads are made with stiffer wadding so that they won't collapse under the weight of 4 or 5 plates. Then glue is dropped on all of the wads, then sea shells from Pawley's Island are placed on the wads to make a nice flashing mark where the wad would have left just a dry white dot. The shells resist the salt and keep the plates from sticking, too. Then the plates are carefully stacked. 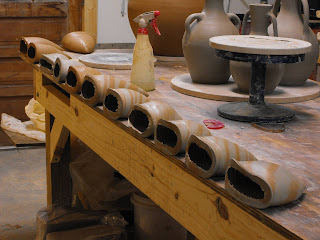 Just as with the kiln shelves where the posting has to be supported one above the other, the wadding has to be in-line. 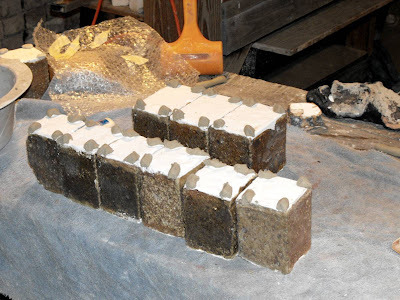 Here is the actual stack placed in the kiln. 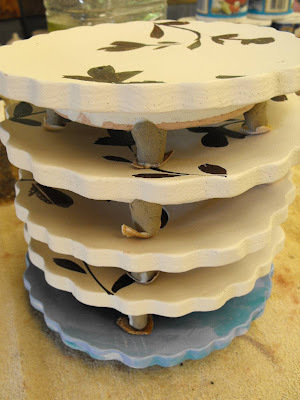 On top of the stack are some cups that also have shells glued to the wadding. Speaking of posts, aka. 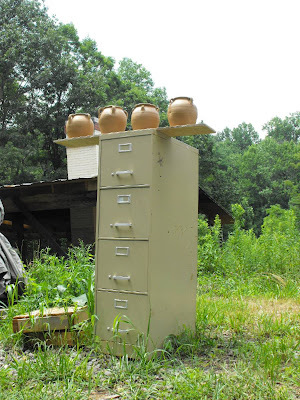 kiln furniture. I wad all of the posts so they will stack without wobbling. Also the soft wadding conforms nicely with crooked, warped shelves! Since I use a lot of these, the wadding process gets expedited by rolling a coil of wadding and the running the wadding along each corn and pinching off a little bit rather quickly. There's no need nor time for carefully rolling wads. 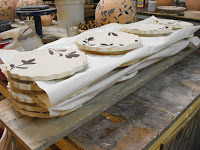 These wads are glued on as well so that they won't fall off as I stack them into the kiln. My neighbor Tom Dancer brought over by a little box of glass from his days as a glassblower. 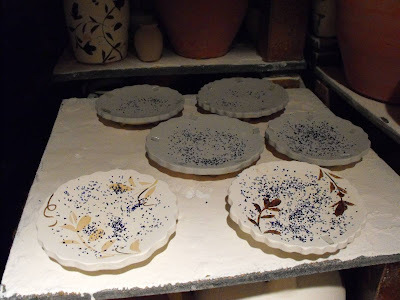 I sprinkled some of the blue granulated stuff on these plates as an experiment. I also took some plate glass on the upper edges, hoping it will run down into the center a little bit. Here's John Simmons, one of the heroes of the firing, coaxing the pyrometer into the 2000's. Not only did John bring a trailer load of kiln dried 3% moisture oak and poplar from Johnson City. He helped cut and stack it as well. 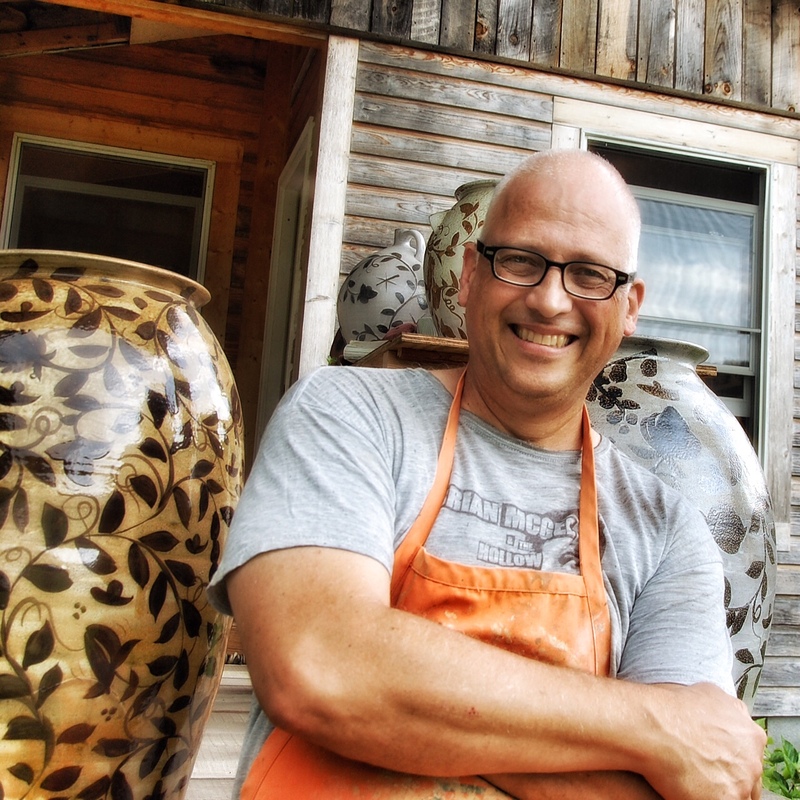 John has a few pots in the kiln, and I hope he'll be rewarded for his giant efforts. 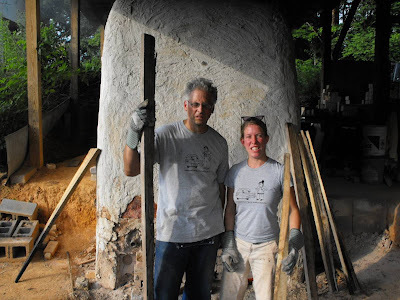 Here's John Geci, a neighbor and glassblower getting it hot at the end of the firing. Here's Courtney Martin, Geci's newlywed, and I kicking some cone nine azz [as gary would say]. We're also sporting some Ayumi Horie His/Hers T's. Git your magic firing shirt here. Well that's all for now. I'll unbrick and unload the kiln in the morning. It's not easy cramming all of the stuff that happened in the last few days into one post. Maybe I'll spare you. The Sunday firing had already been delayed for a day and couldn't be pushed back any further. The pots I needed to paint and glaze were everywhere. 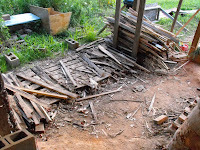 Inside and outside of the shop, in piles. It was pretty intimidating. I usually take at least 4 days to do the work, but reasonably it takes 5 or 6. This time I had 3! You can imagine the picture I would post if I had it. The picture of me sitting there at my bench with my brushes and all of those pots with a look not unlike a deer on my face. It's in those moments when I wish I could just dip the pots and be done. 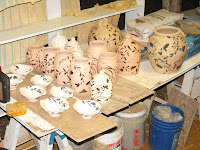 After the painting, came the glaze-a-thon on Friday which went into early early Saturday a.m. I wouldn't recommend this approach to anyone, but it's what had to be done, unfortunately. 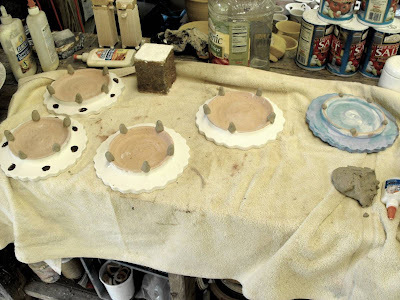 My palette of glazes has to be divvied up not only for the sake of variety, but also for technical reasons. 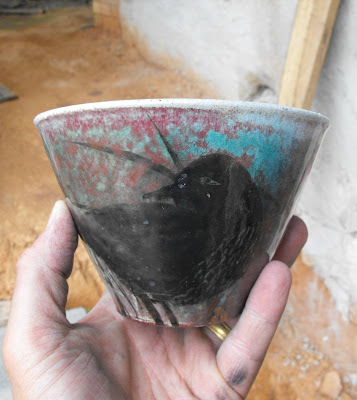 Some places in the kiln are hotter/cooler than others, some places get more salt fuming/glazing than others, etc. So it's hard to keep up with all of this stuff in head, but somehow I intuit all of this stuff. Maybe that is why I use a limited palette, just one slip and 3 glazes. Throughout the process, I get new ideas about pattern, color, and various combos. The brushwork evolves, although it seems to evolve at a slower pace than before in these circumstances. One of the hazards from working under such pressure is that I paint impulsively. This can also yield some pretty fresh deco, too. Quick and spontaneous. I was pretty happy with the painting and deco ideas. Maybe that's enough for tonight. I'm still pretty spent from the work. I'll continue tomorrow with the loading and firing. z z z z z z z z z z z z z z z z z z z z z z z Night Night. 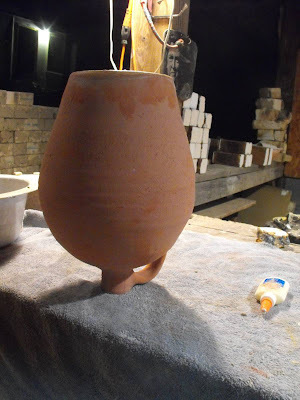 Just briefly, for now, is the news that we had a big day firing the kiln yesterday, #31. It's also been an exhaustive week preparing for the firing and my show at the Washington Street Gallery with Dan Finnegan! It's Dan and I's first show together. I am getting some much needed rest at the home today and am gathering some images from the last week to share with you a bit later today. So stop back by later today! Thanks. 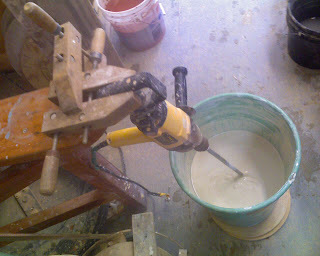 Mixing up a batch of RJB slip. It stands for "Randy Johnston bisque" slip. I have found that if I mix it fresh each time, I get a nice 'crackle' surface. 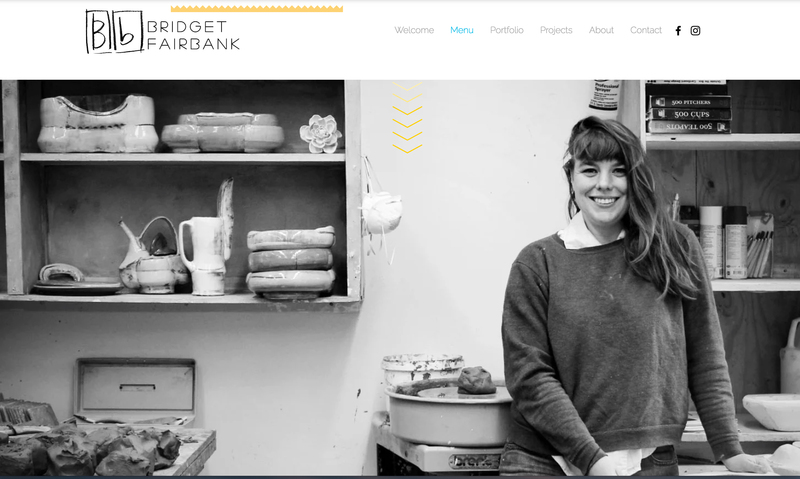 The Archie Bray Foundation for the Ceramic Arts is a public, nonprofit, educational institution founded in 1951 by brickmaker Archie Bray, who intended it to be "a place to make available for all who are seriously and sincerely interested in any of the branches of the ceramic arts, a fine place to work." 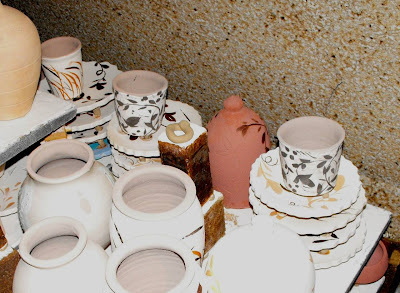 Its primary mission is to provide an environment that stimulates creative work in ceramics. In 1962, I spent the summer working at the Archie Bray Foundation in Helena, Montana. The vastness of the landscape, the feeling of space, light, and color, but most of all the people attracted us to the West. 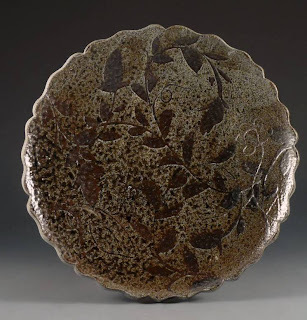 Ken Ferguson was the director and resident potter at the Bray. I was in awe of Ken's production, enthusiasm, and ambition. I wondered why any person would choose to labor so strenuously with so much dedication for so little monetary reward. Little did I realize that one year later I would resign my university teaching position, and move my family to Montana in order to pursue the same goals. To me this was an opportunity creative growth. The Bray is a unique institution. There is no other place quite like it. The challenge seems to breed good potters. While working in relative isolation, you learn to become your own teacher. It was my good fortune to have had the opportunity to guide the Bray during seven critical years. 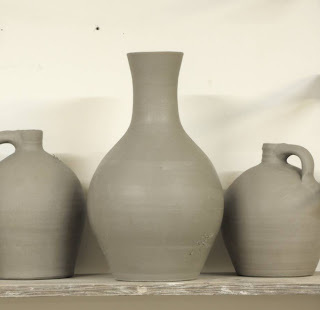 In retrospect, few potters would accept the risk, responsibility, and hard work necessary to keep it alive. 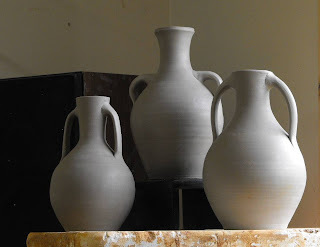 But our family of potters pulled together to meet the challenge. 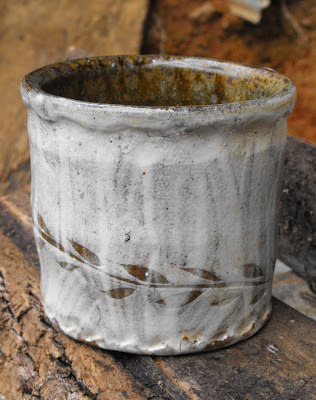 I hope you will join the Archie Bray Foundation and all of the potters who donated their fine work to meet our current challenge by bidding in this online benefit auction. 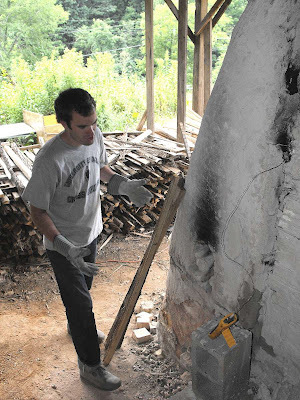 Your support will help potters continue the legacy of Archie Bray as well as folks like Ken Ferguson and David Shaner, who accepted "the risk, responsibility, and hard work, necessary to keep it alive." 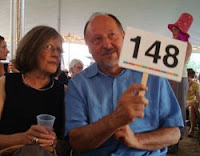 Click here to go to the auction! 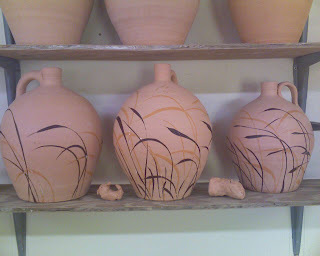 More Reed/Grass pattern pieces. 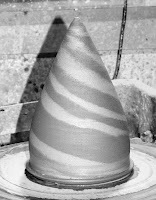 After the pots are painted with two "flavors" of wax resist, they get dipped or poured with slip and glaze. Seems like I couldn't stop myself with this pattern. 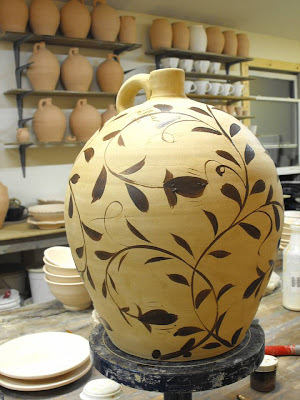 Tonight more vine pattern and big jars. This spring I was happy to see that all the grass seed I had spread behind the shop had taken with all of the rain we had had. It's not easy to grow stuff in this clay! 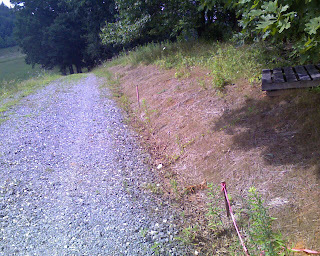 But the hot summer sun and a dry month have taken a toll on the red clay banks behind the pottery shop. 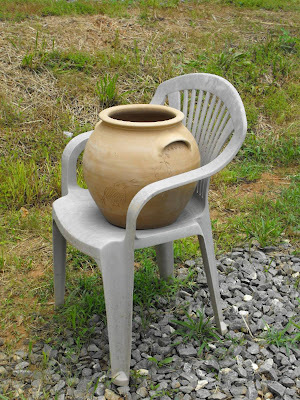 I've happily watched and imagined the grass grow on these pots with hopes that some day the blackberry and the grass will grow high on the banks of clay . 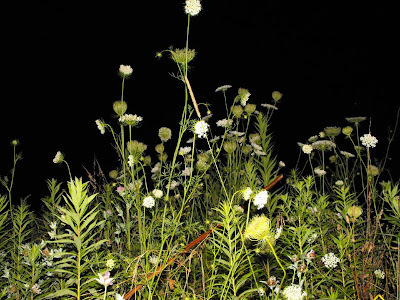 Night photo of wildflowers on the "walk home"
During a run of pottery making, it seems ironic that just when I feel invincible and able to make anything on the wheel, I have to stop and paint and glaze pots! I know at this point I am most likely repeating things I've said in the past. I guess we'll have to accept that. After all, this is post # 839. 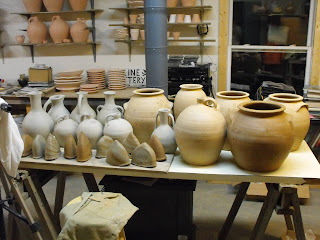 If I could just go for a couple more weeks I could probably make the same amount of pots I've made in last four or five. 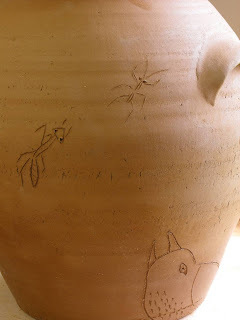 I'll be doing that next Spring preparing for my first kiln opening. (tentatively slated for May 8th of next year!!! Save The Date!) 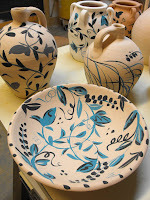 I'll work from January through March on making pots, April will be painting, glazing, and firing! I cut wood with John Simmons who is the current studio assistant up at Penland. John not only brought me a trailer full of kiln dried oak, but helped stack it this evening. 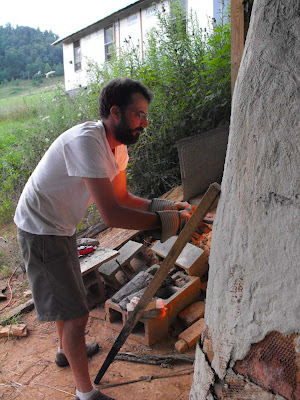 John is a painter and a potter going to ETSU over the mountain in Johnson City, TN. Check out his web site here. Mad props to you John! 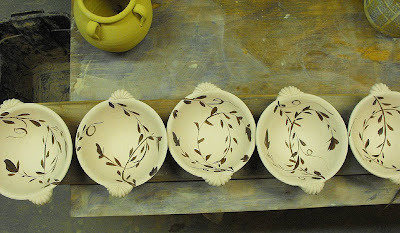 I managed to paint a whole bunch of pots tonight and snapped a few pictures. It takes me a day to get real, real going, and it takes me that long to get the designs flowing. To someone reading this blog for a while, it may seem hat the designs are always the same, vines, vines, vines! But subtle changes evolve and it's just a matter of me remembering it all, yet leaving enough room for new things to happen with this genre. So here are a few things that are fairly pedestrian and hopefully I'll explode tomorrow with more new foliage and maybe some birds. wooohoooo! Who knows what else may emerge during the coming days? 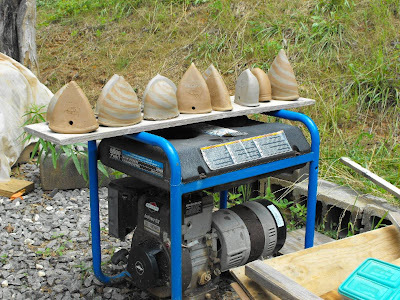 With over 400 pots made and no table left unpiled, I have turned to some unlikely places to dry the last pots. The sun is breaking through the clouds for now so I hurried these guys outside for a little sunning. Revealing this embarrassing situation, to you, my reader, shows that I have nothing to hide! Or should I say, no shame? Which one is your favorite? Maybe I should build a couple of saw horses? But who has time when I should be glazing!? Had a nice conversation with Alex tonight about those wall pockets. It was good to hear he was tying flies in hopes for some fishing here in the hills sometime soon. 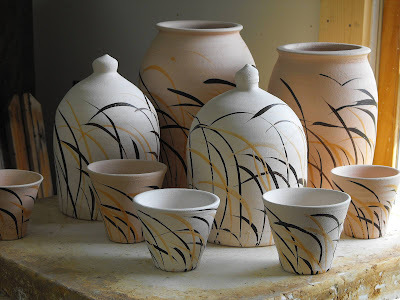 Meanwhile outside there was a lot of rain as I hustled jars that had been sitting outside under the roof to catch a breeze and be dry for the big kiln loading. 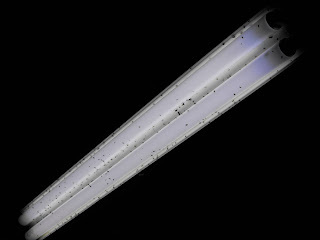 With the rain came some big hatch of teeny little flies that were sneaking in through the open door and hovering near the lights! I'll save a few for Alex. I didn't follow my boss's advice to start painting today, and instead, continued to throw a few more large platters. I lost a couple in the bisque kiln and thought it would be worth squeezing in. The cracked platters had been stacked with sand in between and had little hairline cracks. Damn! I worked on cleaning up the wall pockets and cutting holes in the backs. 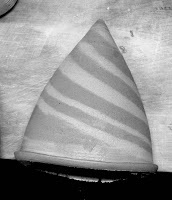 I first took a fettlin' knife to the edges and them smoothed them with a chamois. When I came in this morning several had cracked from being too wet from the throwing and then being closed in the throwing. Alex says that he thoroughly dries the interior before he closes the forms. That should do it for me. My red dirt is really prone to cracking in its wet state. So I spent some time repairing the cracked ones and had an idea to try to "dart" some in the future. One of the intriguing changes that happen when one flattens a thrown form is how that form changes. Exciting, huh? Welcome to my world of pottery intrigue! Anyway, I shuffled and organized the bisque ware and pots still needing to be. 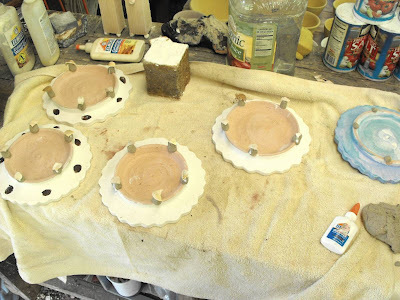 It's becoming clear that there won't be time or room in my electric kiln to bisque everything, so the last few pots will be raw glazed, bone dry glazed. The punch list is bigger than I thought and I'll start hitting it in the a.m. It's never to early for a spot of coffee. 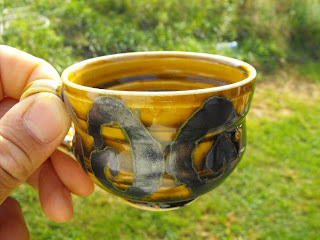 Here is a wee teacup made by Linda Sikora, that some of you may remember I picked up at a local second hand store. I'm happy to be the second hand! 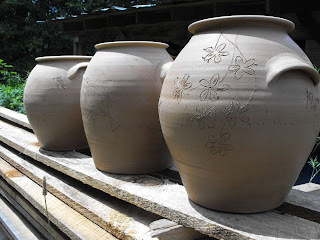 Pots have this secret life as they travel around and if they could only tell the stories! Have a good Monday! Here are a few things that I have been working on over the weekend. 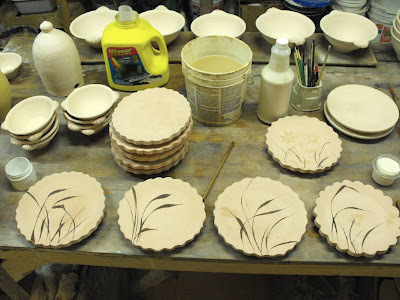 The firing is coming up next weekend and I'd better get to painting the accumulated bisque ware really soon, like Pronto! That's an Americanism from the mid 19th century for "stop throwing those pots and get to painting!" Anyway I took advantage of the dry breezy weather to continue to get stuff dried out for bisqing and did some drawing, aka scratchin', on some jars. 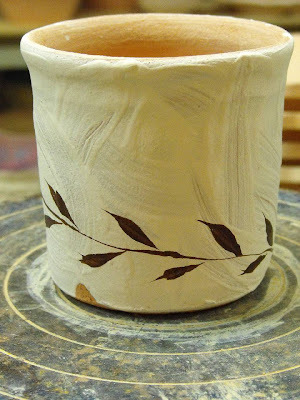 I usually do this on the pots that I'm planning to coat with the crackle slip. It "pushes back" the drawings so that they're subtle amongst the graphic vine pattern. It's a somewhat fun activity, the scratchin', but I'm still a little timid and not as confident as I am with the brush. I returned to a form I haven't made in a few years. Probably since my first show at AKAR about 7 years ago, the bottle. (I guess the handles make these flasks, or flagons. 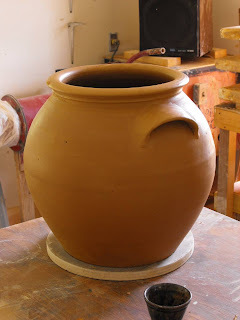 I wasn't so happy about the handles, and with each pot tried something a little different, and left one without handles which I liked. It's a hard call, with just a few to work with. I lost a few in the process of making. One of the redeeming benefits from making a series is that they reflect a process of seeing and updating with each try. 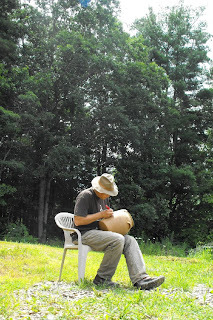 A natural rhythm can be established and the pots go beyond the initial idea/sketch stage and become one's own, hopefully. But one must have faith in the process and stick to it. Tomorrow I hope to wrap up the throwing and set up the deco stage. 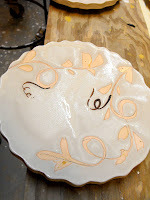 I have a few bisque firings to do still and hopefully will have time for everything I've made in the last few days.